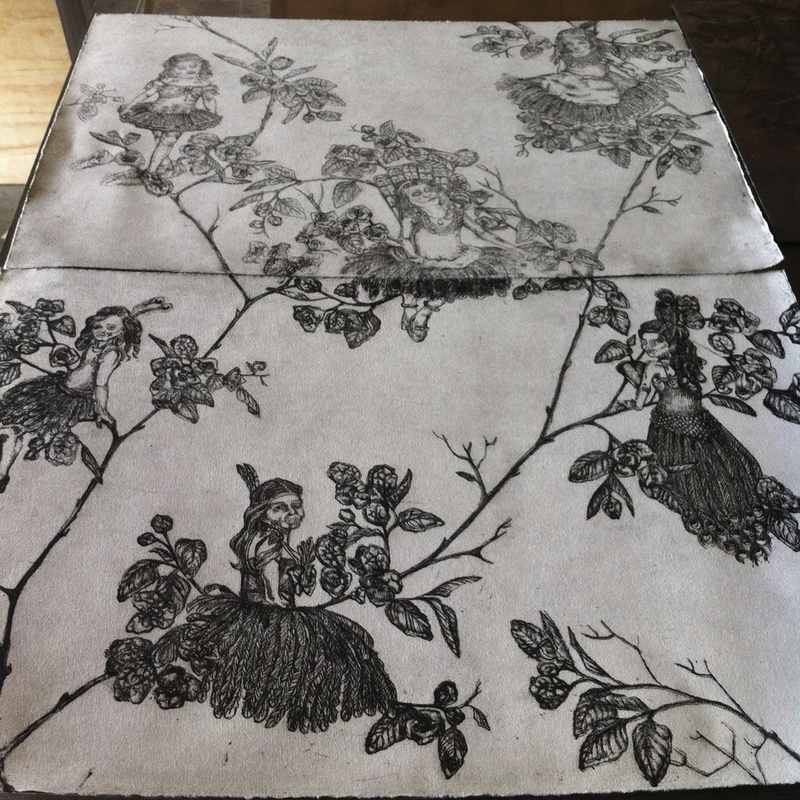 Toile 1355mm (h) x 2000mm(w). Birds of Paradise 1355mm (h) x 2000mm(w). Snap-shot 1355mm (h) x 2000mm(w). Box set of the snapshots. View looking back towards the door. View of the crowd at the opening. The view down the hall way. A bit more to whet your appetite. I hope you're all getting ready for tomorrow night (6th April) at the amazing Rosny Cottage at 5.30 : "High Heels, Plastic Tiaras and Muddy Puddles" finally opens. Here are a few more teasers of the work in the space. Thanks to the hard work of the Rosny farm crew, we have some lovely white walls ready for hanging, and lots of knickknacks to distract me with while I hang. I worked out a long time ago that, as even the best printmakers I know and those most generous with their knowledge are happy to admit, printmaking sometimes has a mind of its own. Like an an unruly child, it does as it pleases. So I thought I'd show you some of my finer moments. These softgrounds refused to work or be consistent over the two plates. However, I finally whipped them into shape after commandeering a hotplate (and possibly crying more then once and swearing I'd never use a liquid ground again...). I think having that second plate allowed me to add more colour to the final image, so through my failure I succeeded! School is back and the sun's still shining, but we've been struck down with a heart of darkness type of winter cold which has been playing havoc with my desire to stand and print all day. So at week 3 of it, I'm impressed that I have achieved a final print of Wallflower. A garage door is a great place to photograph your work! 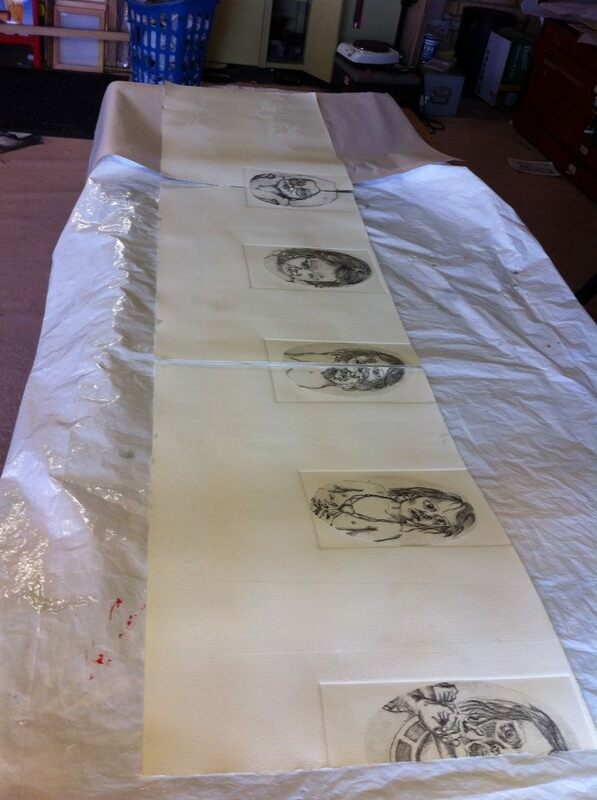 50 prints in a row. There is nothing like a nice and complex registration puzzle to keep the studio interesting. Thanks to a 3.30 delivery of a cup of tea and toast, I've made it to the end of a massive week. This means all my intaglio plates are printed for High Heels, Plastic Tiaras and Muddy Puddles. Wallflower will consist of 50 plates/blocks in the end. Exhibition details for Rosny Cottage 8th April to 1st of May. High Heel, Plastic Tiaras and Muddy Puddles.